It's easy to spend hours watching new videos online when you have a reliable internet connection, but if you're going to be offline, you might want to save a collection of clips as audio files on your phone to listen to them whenever you want. With the access to so many video converter apps nowadays, choosing a quality one that will convert your audio files easily with good results is hard. Luckily for you, we found the right app to help you with that. Let’s see what the app is all about. What is Video to MP3 Converter all about? 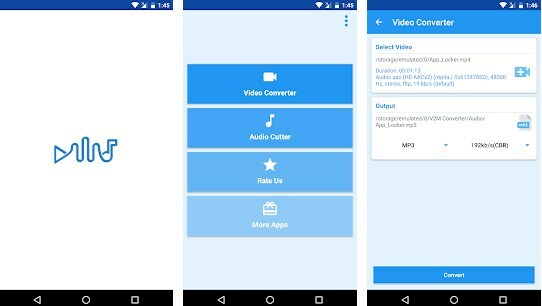 The Video to MP3 Converter is developed for android users as one very practical and helpful converter app for users that need help to convert video files from their phone into mp3 files without much effort. With the help of the app, users will be able to convert video to audio file easily and quickly, keeping all converted files organized within the app. All the files that the user converts are with great quality and each time the app gives the users great results. Users can convert as many videos as they want and the app supports various types of audio files for converting. This video to mp3 converter app is helping users to quickly and without much effort with practical features turn their videos to audio files. On the app users are able to get converted different types of videos like 3GP, FLV, MP4 to audio and this app also offers them to do easily audio cutting and set those cut files as ringtones on their android phones. Also, the app supports various types of audio files such as MP3, AVI, WMA and the user is offered to convert as much files as he wants and keep all of them within the app organized finding them easily when he needs them. On the app background conversion with notifications for the user is supported as well and the users has the choice to auto pick the best bit rate and metadata of files so he can get the best results of his converted videos. Each converted files is offered to the user with great quality so he can enjoy the audio files he converts with the app. Download it for free on Google Play now to convert your videos to mp3 and keep them organized!